As the movement to quantify everything we do continues at a feverish pace, sleep-tracking tech is becoming more and more common — no longer is it just a secondary feature of fitness trackers. The overarching idea behind it all is that, with additional information about the quality of your sleep, you can begin to make changes in your lifestyle to improve it, thus creating a positive effect on your mental and physical well-being. Today, there are a handful of different products on the market capable of measuring your nightly rest and each has its own set of advantages and disadvantages. So we’ve put together this list of the best sleep trackers to help you figure out which one is right for you. Hello’s Sense sleep tracker is sensible in every way and we reviewed the first-generation device in 2016. Now with voice, it’s even better. The hassle-free sphere consistently tracks sleep without a wristband or remembering to engage sleep mode settings. The nest-esque tracker is equipped with an array of sensors — including a microphone, light sensor, particulate sensor, temperature sensor, and humidity sensor — that work to log a summary of your sleep environment. The environmental tracking data is combined with Sense’s tiny “sleep pill,” which attaches to your pillow to log your sleep patterns. The result is a sleep log that’s accessible via the Sense’s mobile app, one that provides a comprehensive sleep grade and a snapshot of how your bedroom environment factored into your sleep. Beddit is one of the original sleep trackers that didn’t require you to wear something likely to interfere with your sleep. Apple scooped up the company in 2017, and at least for the time being, the device is still being sold as a separate product through the Apple Store. 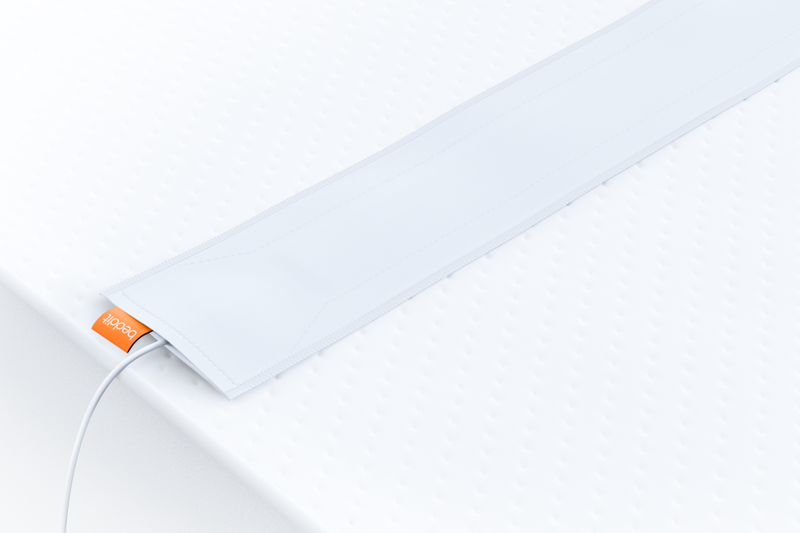 The third-generation Beddit shrinks the sensor even more — so much so you’ll likely not even feel it there. You can also track all kinds of sleep data, including sleep duration, quality, respiration rate, and even your heart rate, and the device automatically knows when you’re asleep so you don’t have to bother with anything. Sleep Number’s SleepIQ for kids makes a lot of sense, even if the bed might be a bit on the pricey side. It’s a mattress with an integrated sleep monitor, which allows parents to monitor their child’s sleep patterns directly from an app. It’s similar to other Sleep Number mattresses, except this one has a few incentives to please the tykes, including gold stars for a good night’s sleep and a “monster detector” that illuminates the space under the bed when the kid wakes up. The mattress also monitors sleep without the need for a bracelet or mattress pad, and the bed comes equipped with a night light parents can turn off remotely when their child falls asleep. Parents can even receive alerts when their kid leaves the bed. Read more here. We’re big fans of Beautyrest’s Sleeptracker, having tested the unit when it first came out in 2017. You place the sensors between your mattress and boxspring, which makes it even less noticeable than the ultra-thin sensors you typically place beneath your sheets with other models. Once installed, the device automatically detects when you fall asleep and records heart and respiratory rate. It also utilizes a built-in artificial intelligence to detect various sleep stages — light, deep, and REM. Over time, the AI engine works to provide you with better sleeping tips based on individual sleep habits, as well as any information you provide after a night of sleep. It’s certainly worth the price, even if it is one of the more expensive options on our list. Read more here. One of the more advanced devices on our list is ResMed’s S+. The robust device basically sits on your nightstand and tracks sleeping habits, without requiring you to put something under your bed sheets. How does it do that? With a combination of ultrasonic pulses and sonar, of course. Using the aforementioned tech, the device is capable of seeing through your blankets and monitoring your chest movements as you breathe, which helps indicate the quality of sleep. Perhaps even cooler is the fact the device matches your breathing rhythm to the tempo of music that can help lull you to sleep. You’ll need your phone to do so, however, as the device plays music via your phone’s speaker. The Aura is a lot like the aforementioned Beddit Sleep Tracker but comes with a few additional features. As with Beddit, the Aura comes equipped with a ballistocardiography sensor pad that slips under your mattress and tracks your movements, heart rate, and respiration. However, this pad is also attached to a color-changing light and speaker. Using these components in tandem, Aura senses when you’re in bed and emit wavelengths of light which enable you to fall asleep faster. It also uses these components to determine when you’re about to wake up, and flicks on a blue light to wake you at the best possible time. Your sleep data automatically syncs with the Withing’s app, aka Health Mate, which then displays your total sleep time alongside metrics culled from other Withings products. The Aura works with the iPhone 4S and later, however, if you’re an Android user, your device needs Bluetooth LE. Read our full review here.